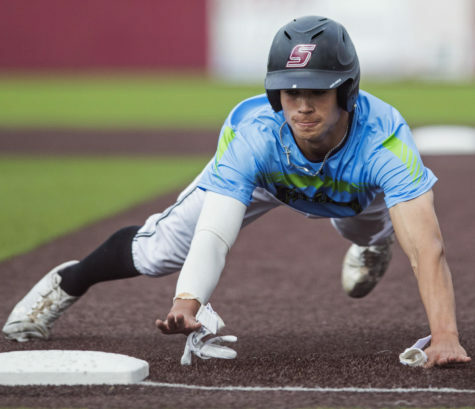 Southern took a 3-2 lead in the bottom of the seventh inning and never looked back, winning the first game of a three-game conference series against Evansville Friday night. 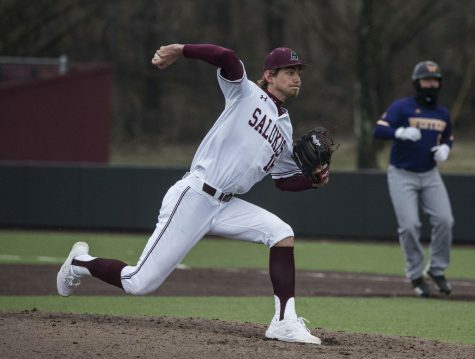 The Salukis (13-14, 1-0 MVC) sent senior starting pitcher Chad Whitmer to the mound Friday to do battle against Evansville’s ace senior starting pitcher Patrick Schnieders in the team’s first conference game of the season. 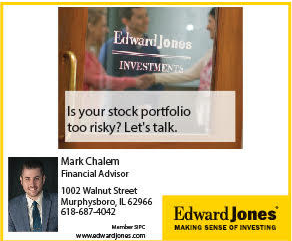 It was apparent early on that Friday night’s game would fit Henderson’s description, as both Whitmer and Schnieders retired the first three batters they faced in the first inning. Evansville (8-18, 0-1 MVC) struck first with two runs in the top of the second against Whitmer to take the lead 2-0. 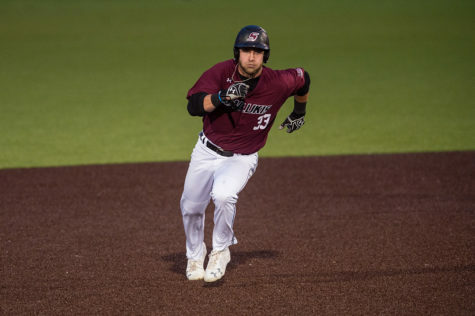 The Salukis put a run on the board in the bottom of the third when junior designated hitter Hunter Anderson scored from third base on junior second baseman Connor Kopach’s sacrifice fly to center field to make it 2-1. 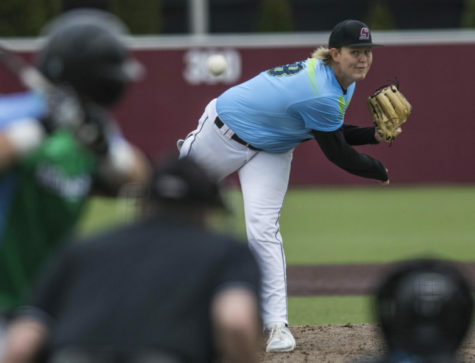 Whitmer found his groove following the top of the second inning, keeping Evansville off of the scoreboard through his final 5.2 innings of work. 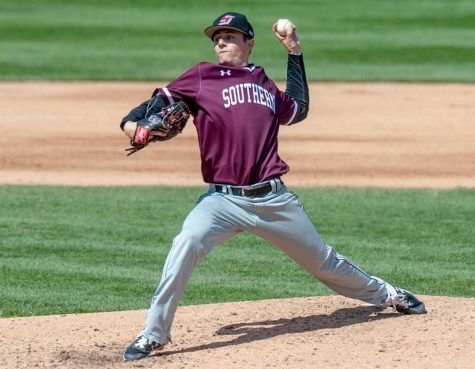 He finished the night with 7.2 total innings, allowing two runs on six hits while walking only one batter and striking out four to keep the Salukis in the game against Schnieders. “You gotta match him pitch-for-pitch, and Whitmer did that,” Henderson said. 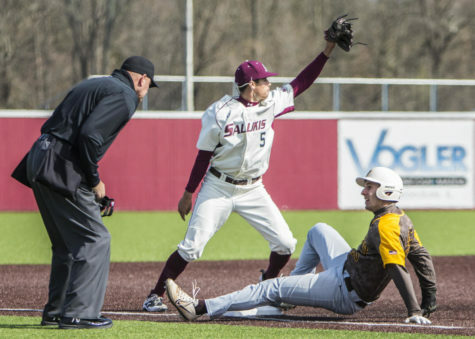 With Whitmer keeping Evansville’s hitters at bay, the Salukis rallied in the bottom of the seventh inning. Junior first baseman Logan Blackfan worked a four-pitch walk off of Schnieders to lead off the inning. 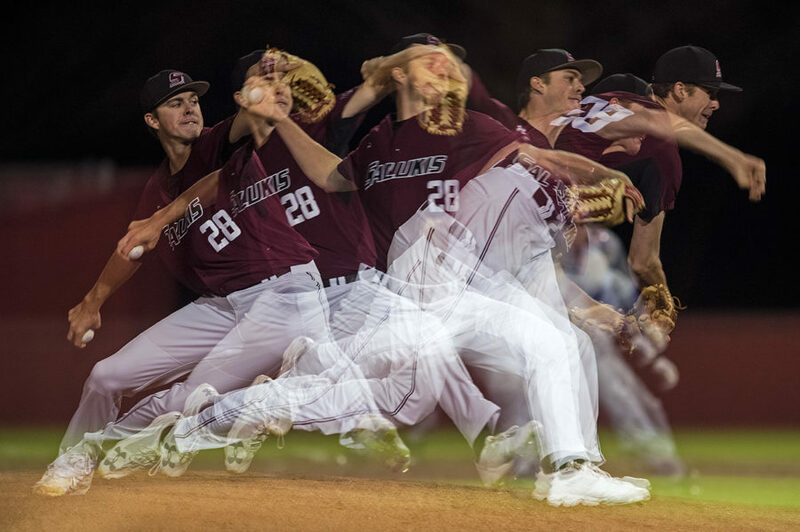 Schnieders was pulled following the walk, ending his night with 12 strikeouts and in line for the win. 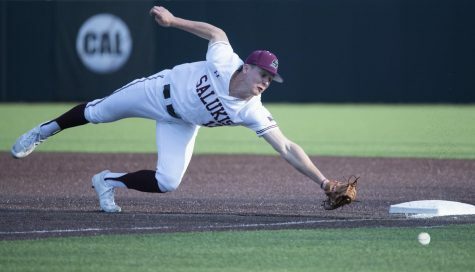 The Salukis took advantage of Schnieder’s exit, with Anderson lacing a single through the right side off of Evansville’s reliever to advance Blackfan to third base. Blackfan would score and Anderson would advance to second base on a wild pitch to tie the game at 2-2. 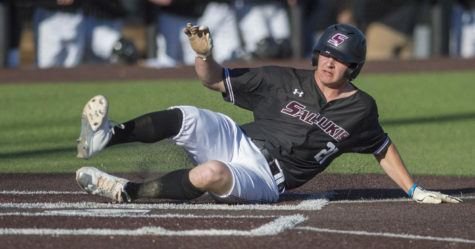 Anderson would come around from second base to score the go-ahead run on senior center fielder Ryan Smith’s RBI single for a 3-2 Saluki lead. 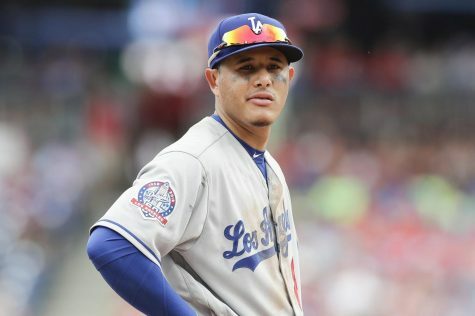 “I tell these guys if you just grind it out and find a way to put a bat on a ball, good things will happen,” Henderson said. Junior pitcher Ryan Netemeyer closed out the top of the eighth after Whitmer exited the game, and returned to the mound for closing duties in the top of the ninth. 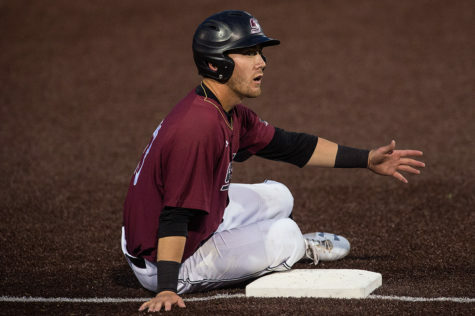 Evansville led off the top of the ninth with a single. The next batter sent a deep fly ball to the warning track in left field, where junior Greg Lambert made a running catch for the first out of the inning. But Lambert dropped the baseball when he reached into his glove to throw the ball back into the infield, and confusion on if Lambert caught the fly ball or not led to Evansville’s first base coach to send the lead-off runner toward second base — where Kopach was now waiting with the baseball that Lambert finally gained control of and threw back into the infield — for an easy tag-out double play. 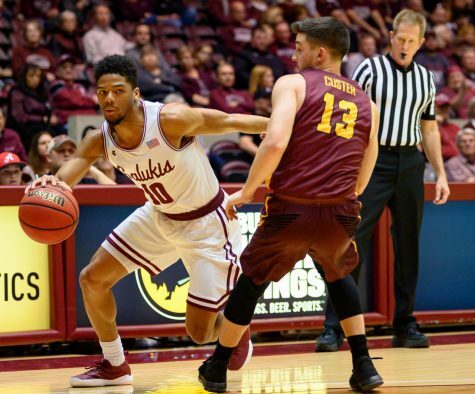 “It was bizarre, I’ll tell you that,” Henderson said about the play. Netemeyer forced a fly out from the final batter to earn his ninth save of the season and close out the win for the Salukis. 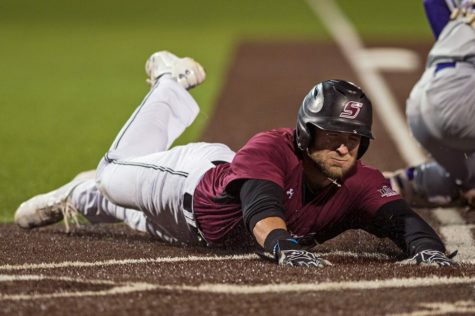 The Salukis bring the intensity back to Itchy Jones Stadium in game two of the three-game conference series against Evansville at 2 p.m. Saturday. Junior starting pitcher Michael Baird is set to take the mound in hopes of moving Southern to 2-0 in conference play.